1982 – PhD Zoology, Zoological Institute Russian Academy of Sciences, Saint Petersburg. Dissertation on "The grey voles (subgenus Microtus, "maximowiczii" group ) of the Eastern Siberia and the Far East". 1975 – M.S. Zoology, Leningrad (Saint-Petersburg) State University. "The peculiarities of dental morphology and ontogenesis in some representatives of the family Cricetidae". 1974 – B.S. Zoology, Leningrad (Saint-Petersburg) State University. "The peculiarities of dental ontogenesis and morphology in the large and the red-tailed gerbils". 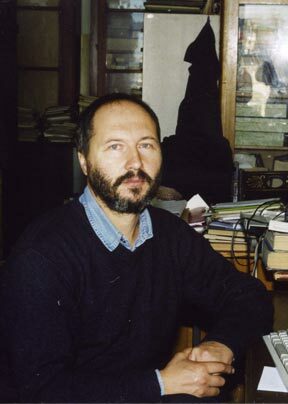 1992 to present – Senior Research Scientist, Laboratory of Theriology, Zoological Institute of the Russian Academy of Sciences, Saint-Petersburg, Russia. 1986-1992 – Research Scientist, Laboratory of Theriology, Zoological Institute of the Russian Academy of Sciences, Saint-Petersburg, Russia. 1980–1986 – Junior Research Scientist, Laboratory of Theriology, Zoological Institute of the Russian Academy of Sciences, Saint-Petersburg, Russia. Morphology, zoogeography, systematic, phylogeography and biodiversity of mammals (Rodentia), the systemic approach to taxonomy and evolution. Golenishchev F.N., Koenigswald W.v. 1978. The rate of teath growth in Microtinae (Mammals, Rodentia). In: Functional morphology and systematic of mammals. (P.P.Strelkov ed.). Proceeding of the zoological institute. Leningrad. 79, p. 102-104. [In Russian]. Koenigswald W.v, Golenishev F.N., 1979. A method for determining growth rates in continuously growing molars. J. Mammal., 60(2): 397-400. Golenishchev F.N., Radjabli S.I., 1981. A new species of voles from the bank of the Evoron lake. Doklady of the Russian Academy of Science, 257(1): 248-250. [In Russian with English summary]. Golenishchev F.N. 1982. Morphological peculiarities and distribution of closely related species of voles of genus Microtus: M. mujanensis Orlov et Kovalskaja, 1975 and M. maximowiczii Schrenk, 1858. In: Morphology and systematic of mammals (R.S. Poljakova ed.). Proceeding of the zoological institute. Leningrad. 115, p. 73-84. [In Russian]. Zubtsova G.E., Golenishchev F.N. 1982. Incisor enamel ultrastructure in rodents burrowing in different ways. In: Morphology and systematics of mammals (R.S. Poljakova ed.). Proceeding of the zoological institute. Leningrad. 115, p. 38-45. [In Russian]. Meyer M.N., Radjabli S.I., Bulatova N.Sh., Golenishchev F.N., 1985. Karyological peculiarities and probable relations of common voles of the group “arvalis” (Rodentia, Cricetidae, Microtus). Zoologicheskii Zhurnal, 64(3): 417-428. [In Russian with English summary]. Alexeeva E.A., Golenishchev F.N. Fossil remains of gray voles of the genus Microtus from the cave Bliznetz (Southern Far East). In: Rodents and Lagomorphs of the late cainozoic. Proceeding of the zoological institute. Leningrad. 156, p. 134-142. [In Russian, with English summary]. Sablina O.V., Zima J., Radjabli S.I., Krustufek B., Golenishchev F.N., 1989. New data on karyotype variation in the pine vole, Pitymys subterraneys (Rodentia, Arvicolidae). Vestnic Cesk. Spol. Zool., 53: 295-299. Golenishchev F.N., Gerasimov S., Sablina S.A. 1991. Reproduction, postnatal grows and development of the voles of the subgenus Sumeriomys. In: Questions of systematics, faunistics and palaeontology of small mammals. (M.V. Zaitsev ed.) Proceeding of the zoological institute. Leningrad. 243, p. 71-80. [In Russian, with English summary]. Golenishchev F.N., Sablina O.V. 1991. On taxonomy of Microtus (Blanfordimys) afghanus. Zoologicheskii Zhurnal, 70(7): 98-110 [in Russian, with English summary]. Zorenko T.A., Golenishchev F.N., Skinderskaya I.A., 1997. Behavior in social voles of subgenus Sumeriomys (Rodentia, Arvicolinae) in hybridization. Baltic J. Lab. Anim., 7: 77-102. Kotcheva M., Golenishchev F., Gerasimov S., 1997. Comparative analysis of the somatometric measures of Microtus guentheri and Microtus socialis. Ekologija, 32(1): 129-137. Golenishchev F.N., Malikov V.G., Arbobi M., Bulatova N.Sh., Sablina O.V., Polyakov A.V. 1999. Some new data on taxonomy of the genus Microtus (Rodentia, Arvicolinae) from Iran. Proceedings of the Zoological Institute RAS. 281, p. 15-20. Golenishchev F.N., Malikov V.G., Bulatova N. Sh., Vaziri A. Sh., Nazari F. 2000. Some new data on morphology and karyology of Microtus kermanensis (Rodentia, Arvicolinae) and supposed phylogeographic history of the “arvaloid” voles. In: Systematic and Phylogeny of the Rodents and Lagomorphs (A.K. Agadjanian, V.N. Orlov eds.) Moscow, p. 34-36. Golenishchev F.N., Malikov V.G., Vaziri A. Sh., Morowati M., Bulatova N.Sh., Sablina O.V., Polyakov A.V. 2000. Some preliminary data on taxonomy of the subgenus Sumeriomys (Rodentia, Arvicolinae). In: Systematic and Phylogeny of the Rodents and Lagomorphs. (A.K. Agadjanian, V.N. Orlov eds.). Moscow, p. 36-38. Meyer M.N., Golenishchev F.N., Bulatova N.Sh., Packevich E.S. 2000. The reproductive isolation between two karyomorphs of Microtus arvalis. In: Systematic and Phylogeny of the Rodents and Lagomorphs. (A.K. Agadjanian, V.N. Orlov eds.). Moscow, p. 114-116. Golenishchev F. N., Meyer M. N.,. Bulatova N. Sh., 2001. The hybride zone between two karyomorphs of Microtus arvalis (Rodentia, Arvicolinae). Proceedings of the Zoological Institute RAS, 289, p. 89-94. Golenishchev F.N., Sablina O.V., Borodin P.M. & Gerasimov S. 2002. Taxonomy of voles of the subgenus Sumeriomys Argyropulo, 1933 (Rodentia, Arvicolinae, Microtus). Russian Journal of Theriology, 1(1): 43-55. Golenishchev F.N., Petrovskaya N.A. 2002. Geographic variation of Microtus (Stenocranius) gregalis Pall., 1779. Golenishchev F.N. & Nikulina N.A. (eds.). [Theriological Investigations]. St-Peterburg: Teriologicheskoe Obshchestvo, 1: 17-34 [in Russian, with English summary]. Golenishchev F.N.& Malikov V.G. 2002. Reconstruction of microevolution within different groups of lowly divergent forms belonging to the family Cricetidae (Rodentia). Proceedings of the Zoological Institute RAS. 296, p. 47-52. Golenishchev F.N., Malikov V.G., Nazari F., Vaziri A.Sh., Sablina O.V., Polyakov A.V. 2003. New species of vole of "guentheri" group (Rodentia, Arvicolinae, Microtus) from Iran. Russian Journal of Theriology. 1(2): 43-53. Golenishchev F.N., Malikov V.G. 2003. Evolutionary and systematic aspect of historical interrelations of discretely heterogenic genetic pools. Theriological Investigation. St. Petersburg, 3, p. 23-40. [in Russian, with English summary]. Bulatova N.Sh., Golenishchev F.N. 2003. The “arvalis” group (Rodentia, Microtus) as a model of a subject for studies in evolution, phylogenetics and genetics (dr. M.N. Meyer’s contribution of science) Theriological Investigation. St. Petersburg, 3, p. 82-93. [in Russian, with English summary]. Golenishchev F.N., Malikov V.G., 2003. Intrageneric modules of taxonomic diversity as integral subjects of evolution. In: Systematics, phylogeny and paleontology of small mammals. Proceedings of International Conference devoted to the 90-th anniversary of Prof. I.M. Gromov. St. Petersburg, p. 64-66. [in Russian, with English summary]. Golenishchev F.N., Malikov V.G. 2004. Palaearctic and Nearctic common voles (Rodentia, Arvicolini): evolutionary and taxonomic outlook. Proceedings of the Zoological Institute RAS, St. Petersburg, 300, p. 83-90. Bulatova N., Golenishchev F., Bystrakova N., Pavlova S., Koval’skaya J., Tikhonov I, Didorchuk M., Ivanov K. 2007. Distribution and geographic limits of the alternative cytotypes of two Microtus voles in European Russia. Hystrix It. J. Mamm, 18(1): 99-109. Voyta L.L., Golenishchev F.N. 2007. Geometric morphometry of molars in three species of the common field vole, the subgenus Alexandromys (Rodentia: Cricetidae: Microtus). In: Mammals of mountain territories (Rozhnov V.V., Tembotova F.A., eds. ), Moscow. KMK Scientific Press, p. 79-84. [In Russian]. Malikov V.G., Golenishchev F.N. 2007. Mountain rodent faunas as indicators of formation specificity within various lineages. In: Mammals of mountain territories (Rozhnov V.V., Tembotova F.A., eds.). Moscow: KMK Scientific Press, p. 201-202. [In Russian]. Sitnikova N.A., Romanenko S.A., O’Brien P.C.M., Perelman P.L., Rubtsova N.V., Serdukova N.A., Golenishchev F.N., Yang F., Ferguson-Smith M.A., Graphodatsky A.S. 2007. Chromosomal evolution of Arvicolinae (Cricetidae, Rodentia). I. The genome homology of tundra vole, field vole, mouse and golden hamster revealed by comparative chromosome painting. Chromosome Research. 15(4): 447-456. Potapov S., Bulatova N., Pavlova S., Lavrenchenko L., Golenishchev F., Bystrakova N. 2007. A pilot study on boundaries of two chromosomal forms of the common vole in Russia by means of mt-DNA analysis. In: Molecular-genetic basis of biodiversity of mammals of the Holarctic. Moscow: KMK Scientific Press, p. 205–212. [In Russian]. Golenishchev F. N. 2008. Egorov’s Narrow-skulled Vole (Rodentia, Arvicolinae) from the Late Pleistocene of Eastern Siberia, a North American Immigrant. Paleontological Journal, Pleiades Publishing, Ltd. Vol. 42, No. 3, pp. 292–296. Lavrenchenko L.A., Potapov S.G., Bulatova N.Sh., Golenishchev F.N. 2009. A genetic study of natural hybridization between two forms of the common vole (Microtus arvalis) with the use of molecular and cytogenetic methods. Doklady Biological Sciences, 426(1):222-224. Malikov V.G., Golenishchev F.N. 2009. The systemic concept of formation and the problem of species. In: Species and speciation. Analysis of new views and trends. (Alimov, Stepanjats eds. ), KMK, Proceedings of the Zoological Institute of the Russian Academy of Sciences. Supplement 1: 117-140. [In Russian]. Bannikova A.A., Lebedev V.S., Golenishchev F.N. 2009. Taxonomic position of Afghan vole (Subgenus Blanfordimys) by the sequence of the mitochondrial cytb gene. Russian Journal of Genetics, 45(1): 91-97. Borodin P. M., Basheva E. A., Torgasheva A. A., Golenishchev F. N., Kartavtseva I. V. 2010. Chromosome synapsis and recombination in Muja vole (Microtus mujanensis). “Vestnik” of Novosibirsk State University 8(3): 124-130. [In Russian with English summary]. Bulatova N.Sh, Golenoshchev F.N, Koval'skaia Iu.M, Emel'ianova L.G, Bystrakova N.V, Pavlova S.V, Nadzhafova R.S, Lavrenchenko L.A. 2010. Cytogenetic study of the parapatric contact zone between two 46-chromosomal forms of the common vole in European Russia. Genetika, 46(4):502-508. [In Russian with English summary]. Lemskaya N.A., Romanenko S.A., Golenishchev F.N., Rubtsova N.V., Sablina O.V., Serdyukova N.A., O’Brien P.C.V., Fu B., Ferguson-Smith M.A., Yang F., Graphodatsky A.S. 2010. Chromosomal evolution of Arvicolinae (Cricetidae, Rodentia). III. Karyotype relationship of ten species from genus Microtus. Chromosome Research, 18(4): 459-471. Borodin P.M., Basheva E.A., Dashkevich O.A., Golenishchev F.N., Kartavtseva I.V.. 2011. X-Y Chromosome Synapsis and Recombinationin 3 Vole Species of Asian Lineage of the genus Microtus (Rodentia: Arvicolinae). Cytogenet. Genome Res., 132(1-2):129–133. Safronova L. D., Golenishchev F. N., Cherepanova E. V., Baskevicha M. I. 2011. Meiosis in Gray Voles of the subgenus Microtus (Rodentia, Arvicolinae) and in Their Hybrids. Russian Journal of Genetics, 47(7): 857–863. Ostromyshenskii D.I., Kuznetsova I.S., Golenischev F. N., Malikov V.G., Podgornaya O.I. 2011. Satellite DNA as a phylogenetic marker: Case study of three genera of the murine subfamily. Cell and Tissue Biology, 5(6): 543 - 550. Golenishchev F.N., Malikov V.G. 2011. The systematics and distribution of the grey voles of the tribe Microtini (Rodentia, Arvicolinae) in the Caucasus and Asia Minor. In: Proceedings of the international conference “Biological diversity and conservation problems of the fauna of the Caucasus”. Yerevan. Armenia. pp. 101-105. [In Russian with English summary]. Borodin P.M, Basheva E.A, Golenishchev F.N. 2012. Rise and Fall of the Y-chromosome. Priroda, 1: 45-50. [In Russian]. Borodin P.M, Basheva E.A, Torgasheva A.A, Dashkevich O.A, Golenishchev F.N, Kartavtseva I.V, Mekada K, Dumont B.L. 2012. Multiple independent evolutionary losses of XY pairing at meiosis in the grey voles. Chromosome Res, 20(2):259-68.